Nvidia has just announced their new GeForce GTX 980 Ti GPU, a model that should take the space in between GTX 980 and the Titan X both in terms of performance and in terms of price. The GTX 980 Ti is essentially a slightly stripped down version of the Titan X GPU with slightly less CUDA cores that are 2816 here and with a bit less TMUs – 176 units. The other significant difference in comparison with the Titan X is that the GTX 980 Ti comes with 6GB of video memory instead of 12 GB. The recommended end user price of the new GTX 980 Ti GPUs is $649 USD so it is significantly better priced as compared to the Titan X and considering that it should be showing a very similar performance it sounds like an interesting product not only for gaming, but for crypto mining as well. 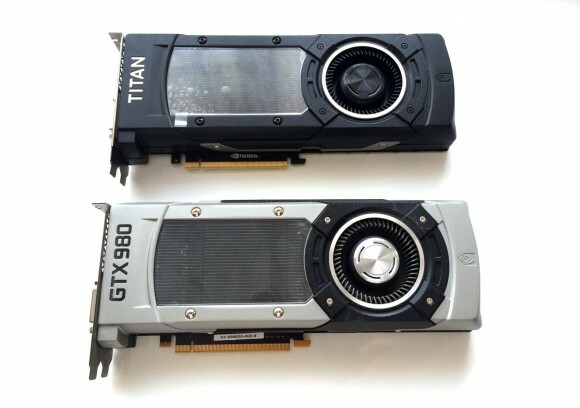 There are probably not much, if any, people out there mining for crypto coins on the latest and fastest Nvidia Geforce GTX Titan X GPUs, but that does not mean that the video cards based on them are not good for mining. The GTX Titan X does come with 12 GB of video memory, something that is not very useful for crypto mining, but it also comes with 50% more CUDA cores as compared to GTX 980. 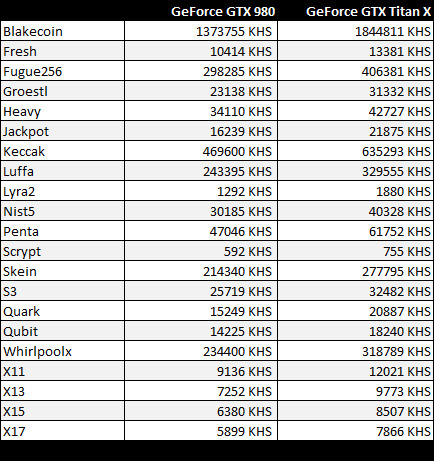 So you might expect to get up to about 50% performance in crease in terms of hashrate, but that performance increase may come up with twice or even more higher price compared to how much a single GTX 980 costs. 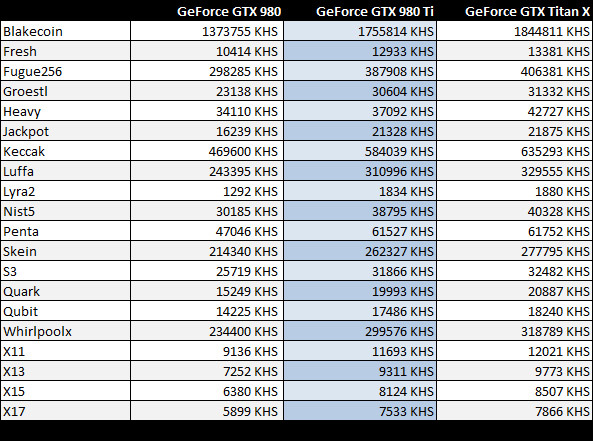 So it seems that the GTX Titan X is not very price/performance efficient choice and it might be better to go for two GTX 980s instead not only for mining, but also for gaming as well. Nevertheless we still ran some benchmarks to see what is the actual hashrate difference between a GTX 980 and a GTX Titan X GPU using the latest ccMiner 1.5.45 SP-MOD. Do note that the Titan X is still a Compute 5.2 GPU, just like the GTX 980, so it does not bring a new evolution in terms of compute capabilities – just more raw power. As you can see from the table with the results we are seeing in between 30% to almost 50% performance increase in the hashrate of the GTX Titan X GPU as compared to what the GTX 980 currently offers. As we have already mentioned the price difference compared to the actual performance you get makes the GTX 980 the better choice for mining, and you can go for two of these instead of a single Titian X.